A couple of notes on this recipe...first, it calls for self-rising flour, which I essentially DIY'ed by whisking in 1 1/2 teaspoons baking powder and 1/4 teaspoon salt for each 1 cup of all-purpose flour. You will need 1 3/4 cups of this flour for the recipe. And you know how we're typically instructed to work the butter into the dry ingredients until a "coarse meal" forms, and you see some pea-sized bits remaining? In the case of British-style scones, you work the (smaller amount of) butter well into the dry ingredients to the texture of breadcrumbs. In other words, you want a finer consistency and the butter to be well incorporated into the flour. The "breadcrumb" description is one I saw often. And the resulting dough...it will be fairly wet and sticky. I'm used to a dry, often difficult-to-bind-together dough when it comes to American-style scones. According to Mary Berry, the wet and sticky dough is one of the secrets to a good Devonshire scone, together with not handling the dough too much. Warnings like that scare me a little, and I almost feel like I under-handled the dough, if that's even possible. I pressed the dough out to about a 3/4 inch thickness (instead of the instructed 1/2 inch), then cut the scones out using about a 2 1/2 inch round biscuit cutter (I don't have a 2-inch one which seems to pop up a lot). Try to cut the rounds by pressing the cutter straight down into the dough, without twisting, so they maintain their shape and rise evenly while baking. Be sure to thoroughly flour the surface you're working on. Since the dough is rather wet and sticky, they are a bit tricky to remove, as I experienced firsthand. I have to admit I only got 6 biscuits out of my batch, instead of the 12 I might have expected. However, I did make the dough a little thicker and cut my scones a bit larger than the original recipe. I could probably have squeezed another one out of my dough scraps but honestly, I was trying to quit while I was ahead! I was relieved when the scones proved to be soft, fluffy, and cake-like in the middle, as they are intended to be. They're also a bit crumbly, too, which you'll notice as you spread your topping onto a split scone. The mildly sweet flavor is a great base for your jams and other toppings of choice. I always love trying something a little different and this was no exception! * To make a substitute for self-rising flour: For each 1 cup of all-purpose flour, whisk in 1 1/2 teaspoons baking powder and 1/4 teaspoon salt. Preheat oven to 425 degrees. Line a baking sheet with parchment paper or silicon baking mat. Sift flour into a medium-size bowl. Rub butter into the flour with your fingertips until it resembles fine breadcrumbs. Stir in the sugar. Break egg into a 1-cup liquid measuring cup. Add enough milk to reach the 2/3 cup mark. Beat lightly with a fork to combine. Add the milk mixture to the bowl and mix with a fork to form a soft dough. The dough will be on the wet and sticky side. Turn the dough out onto a work surface that's been dusted with an even coating of flour. Lightly knead the dough until smooth. Roll/pat dough until about 1/2 to 3/4 inch thick (I prefer the higher, 3/4 inch, thickness), cut into rounds using a 2-inch round pastry cutter. Press the cutter straight down into the dough, without twisting, to help ensure a more even rise. Transfer to baking sheet. Re-roll scrapes once and cut until dough is used up. Brush tops (not the sides) of the scones with milk. Now I am going to supermarket and get some strawberries because I need to make some jam first! Those scones look fabulous, Monica. haha - Tricia certainly got me to get my hands on more strawberries and stir up this jam. So very easy. When done well, scones are my favorite morning treat! And British style are the best. These look delicious! I never knew scones were such a wonderful thing...glad my eyes have been opened in the last few years. I've always wondered about the difference between American and British scones. While in Ireland we found the scones to be much like the ones here in your recipe. No fruit, light and cut into rounds. And yes we slathered them with that wonderful Irish butter made from happy cows. These are wonderful and thanks so much for the explanation! Have a great week. 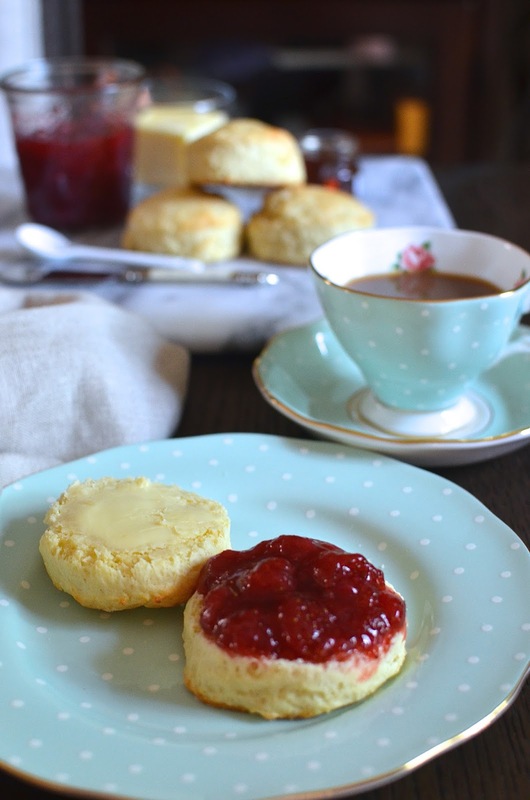 I've never actually had British style scones but now I want to make some of both and do a taste test side by side! haha any excuse to make scones right?? And some jam! Hi Monica, now I'm going to have to make these British scones, they look delicious and like a cross between a english muffin and a biscuit. And I love what you wrote about the ceremony of sitting down and deciding what to top them with, so nice. That's so nice of you, Cheri! : ) I do think the 'ceremony' of sitting down and looking around, picking what we should spread out scones with and having a few laughs about it made it all the more fun and delicious. : ) Keep having a great summer! I love scones but have never made British scones. They look so good and i love the ritual of splitting and dressing up the scones with ones choice of jam or spread. Such a fun treat! 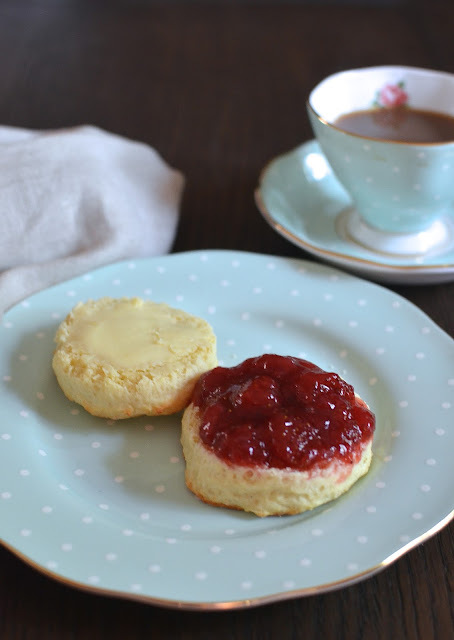 I would love to wake up to these yummy scones for breakfast! They look so fluffy and delicious! Especially perfect served with your homemade jam! Oh I love this so much! 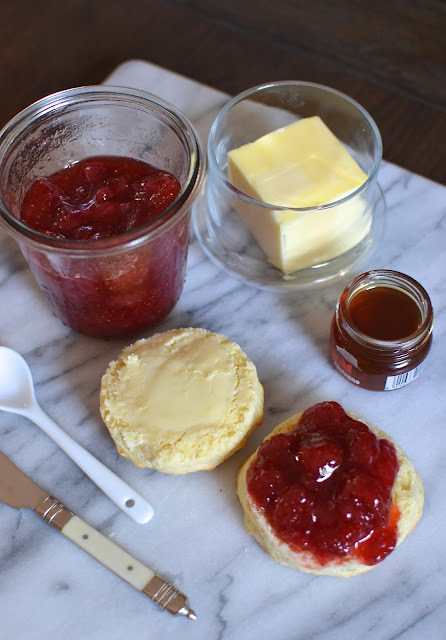 !I have never made British style scones before, and after seeing how easy and tasty these are — I so want to try them now! And that jam on top is making me drool! AWESOME share, Monica. I'm crazy for scones! Love your homemade version. And I want to put that Jam on everything!!! These look perfect to me! Such a great summer recipe. Any time is a great time for a scone! I love scones. These look so perfect and delicious! Scones are my all-time favourite thing to bake. I make them at least once a week, how very British of me! These look divine. Very British and very lovely of you. I'm sure you could give me many lessons on the art of scone making, and I could use it!! Monica, your scones look awesome, and you just reminded me that I have not had these for a while...thanks for the recipe and yes, perfect with homemade jam. Great and busy week, thanks Juliana! Your scones look pretty amazing to me! I don't know why I don't bake them more often - I really do love them (both British and American). I struggle with scones - can't quite get the hang of it...but it works out well enough for us. Far from gorgeous but quite tasty and really good vehicles for all that jam and butter, etc. Hope you are having a great summer!